The Tour du Mont Blanc is approximately 170km /106 miles long although has some variantes that add to this distance. Most people choose to do the TMB in 8 – 10 days and stay at hotels or refuges en-route. Each daily stage varies in length, but are generally 16-22km / 10-14 miles. Some stages are tougher than others, depending on how much you climb and descend in one day. How long for the Tour du Mont Blanc? Most hikers complete the full TMB in 8-10 days, though some take longer with rest days along the way. If you are not so fit or are carrying a heavy rucsac with camping gear it will take longer. 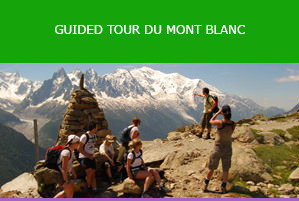 The Tour du Mont Blanc crosses a series of mountain passes with ascents and descents of 1000m or more. Summer is the best season: between June and September when most of the winter snow will have melted. The daily temperatures are favourable, averaging 20ºC to 30ºC in the valleys. It’s also during summer that most of the hotels and auberges are open. It is technically possible to hike the TMB in October, but many of the hotels are shut. From October to May it is either too wet or there will be too much snow. People do the TMB on skis between February and May. It’s also during summer that most of the auberges are open. Via the normal route, the highest point is 2,532m at the Grand Col Ferret, marking the boundary on the TMB between Switzerland and Italy. There are some slightly higher altitudes reached if you choose to take some of the TMB variantes. Here are other major high points along the Tour du Mont Blanc route, assuming you trek clockwise. The Col du Bonhomme (2,479m). 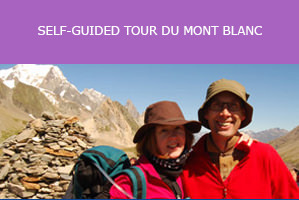 The Tour du Mont Blanc will give you the opportunity to see various species of wild animals such as chamois, ibex, red deer, marmots and stoat. Birdlife is also interesting with common sightings of Lammergeier (bearded vulture) and Alpine choughs. The accommodation options along the Tour du Mont Blanc are a mix of mountain refuges, auberges (inns) and family-run hotels. In the larger towns of Chamonix and Courmayeur there is a greater range with chalets, hostels and 1-5 star hotels. You can camp at all stages of the Tour du Mont Blanc, but you have to stay in registered campsites: wild camping is not allowed.